My name is Eva, I have been a climber since 1990, when I attended a rock climbing class in my hometown (Toledo, Spain), and I have been in love with this sport from the very first move. I began climbing just as I started my Sports Science studies; this made my two passions, climbing and training, complement each other from the beginning. Two years ago I finished my Ph.D. Thesis, on the topic of finger strength training. I have climbed 8c+, and in my role as coach I have helped others’ realizations, like Andrea Cartas winning the Spanish climbing cup, Pablo Barbero onsighting 8b+, Luis Alfonso Félix redpointing 9a+ and Nacho Sánchez bouldering up to 8C. It’s been 8 years since I switched from being a physical education teacher to pursuing my current interests: climbing hard routes, training and conveying what I learn through workshops, clinics and publishing in different media. First of all it’s worth noting that we can significantly reduce the incidence and severity of our injuries, especially in beginners, where a few basic rules are enough, but fully avoiding injury is just about impossible. Mainly because we can’t expect to stay error-free in the long run, and injury is often the result of serious mistakes in periodization or in the choice of loads, but also of the accumulation of smaller errors. And then there are those factors that we can’t either predict or act upon. 1. Sport level. At higher levels, or when the goals are more “ambitious”, the risk of injury is increased because we approach the mechanical limits of the tissues and also because the absolute loads tend to be higher. On the other hand, at lower levels we know that injuries are often associated to insufficient physical and technical preparation, and to the limited adaptation of the relevant soft tissues, mostly at the fingers; stronger athletes get the same kind of injuries but due to different causes or at different times, plus a set of lesions particular to them. For example, given that injuries among beginners tend to have their roots on a deficit of adaptation or a training program that is not well suited to their rock climbing needs, for this group I prioritize long endurance (ARC) and technique. In advanced climbers many injuries stem from overuse, so the focus is on finding the optimal (not the highest) load, learning to control that load, and managing motivation; they alternate concentrated loading cycles with more progressive ones, that either prepare or serve as recuperation from the former. I have also observed that, while beginners suffer their injuries while rock climbing, experts tend to hurt themselves while training, which brings us to the next point. 2. Here’s an interesting phenomenon: while in many sports the most frequent and severe injuries occur in competitions (almost tripling training injuries), this is not the case in climbing. If we define competition as the times we go rock climbing, I feel just the opposite happens. Perhaps this is telling us that we are not choosing correctly the methods, intensity and volume, or that the amount of time we use each load for is wrong. And that is the rationale for the next item. 3. The ratio between acute (1 week long) and chronic (around 4-6 weeks) load matters. There seems to be an association between intensity increasing over 40% and the occurrence of lesions, from which we can infer that raising steadily the load and starting from a solid preparation can have a preventative effect. In this context, concentrated loading cycles are recommendable, but only if the athlete has already gone through easier and more general cycles. With beginners and medium level climbers I only use the latter. 4. A preexisting injury is the best predictor for a more severe one in the same general area, and this signals the importance of not skipping stages as far as healing is concerned, and of following a suitable rehabilitation and re-training plan. Realizing this led me to analyze systematically the factors that are relevant for each lesion, designing a prevention program that tries to minimize the risk of relapse and putting together re-adaptation plans for each individual. This way we have a less ambiguous variant of the classic “slowly going back to climbing”. 5. Acute or chronic shifts in articular and muscle balance. It is known, for example, that the imbalances between flexors and extensors around both the wrist and finger joints goes up with sport level, and also with fatigue. Prolonged exertion also affects proprioception and increases hysteresis (the time it takes an object to regain its original shape once the force that was stretching it is removed) of passive structures like tendons and ligaments. 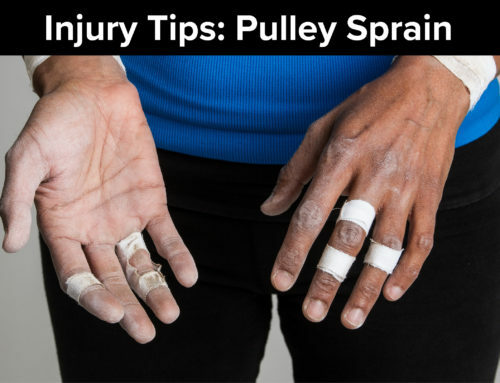 The consequences range from loss of efficiency to wrist instability, damaged cartilages, tendons or pulleys and elbow epicondylalgias. When the endurance and eccentric strength of the shoulder external rotators are too low compared with those of the internal rotators, and the scapular muscles have a relatively low endurance, articular instability can arise, with the risk of developing anterior and superior displacement of the head of the humerus in the long term. Fatigue can induce short-term instability as well, causing unstable or inefficient postures, that are associated to shoulder pathologies in the rotator cuff, SLAP or coracoid/subacromial impingement syndromes. With this in mind we should implement a program of compensatory exercises that work the gamut of gestures opposite to those of our sport – as you, Jared, suggested – with the aim of achieving a more healthy ratio. This is really important for younger athletes and beginners; in the case of women I often include some specific guidelines to compensate for our greater laxity and lower strength that predispose us to certain kinds of lesions. Assessing my athletes’ history of previous injuries and goals, and putting in place a routine of compensatory exercises. In the context of the general planning, choosing the right exercises and methodology for each mesocycle, carefully periodizing volume and intensity. A very important point: teaching how to perform correctly all those exercises and to adjust the load for each of them. 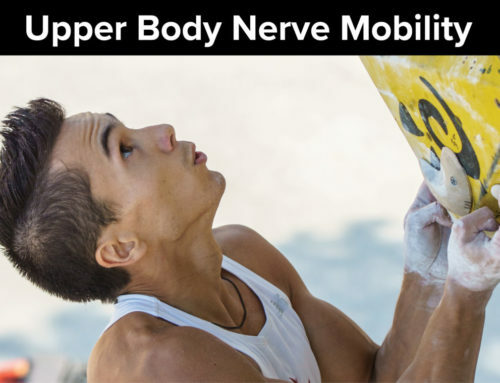 What is the most important advice that you can give climbers to prevent injuries from occurring? In the first place, be coherent; secondly, learn to manage the load for each exercise and method. By coherence I mean being conscious of your personal and external conditions; if we have recently taken up climbing, it’s neither logical nor healthy to try methods oriented to higher level climbers (it’s not even efficient, because easier, safer methods have been shown to provide similar benefits in beginners! ), like campus boarding, weighted dead-hangs, some TRX exercises, etc. Another example is trying to do what would take 3 hours in just 90 minutes due to external time constraints. This way a supposedly “strength” session can become a high-load endurance one, resulting in small to negligible strength gains and risking overuse. If the exercises are of an explosive nature like campusing, it can be worse yet; we have all witnessed sessions where three patterns come together in a dangerous mix: a method is performed to exhaustion, disregarding execution and ignoring that when our power levels drop below certain threshold during the session, that method no longer has the desired effect. Another frequent case of coherence being put aside is trying to pack into a six-week cycle what should take double that time, just two months before our holidays… because developing stamina and endurance does not work like this, and epicondylalgia is right behind the corner. So, when it is managed correctly, the load will allow us to 1) keep a consistently healthy execution and 2) comply with the method’s requirements, in the form of subjective sensations, distance, and time or number of repetitions. If we are struggling to do that, some load parameter has to be modified: hold size and wall angle, added weight, complexity of movements, etc. for maximum strength, length and number of repetitions or pauses for endurance, and edge depth and distance for campus boarding, for citing a few. I also employ a numerical scale which the climber uses to make a daily evaluation of some aspects that tell us whether we are on the right track. Another way to make sure we are fulfilling all those requirements is to educate ourselves on methodology and planning, or hiring a professional coach. If we choose the latter, though, part of our success will depend on our selection criteria. I believe that currently every user of coaching services should take a moment to ponder what he or she thinks a qualified coach is, and act accordingly.